Centrally positioned shift rod. We relocated the shift rod on the new HV2 gearboxes within 1.75 inches of the centerline. This enables a simple, direct and efficient linkage from the shifter to the gearbox. Mid engine ready. We left the original offset shift shaft on the side of the HV2s for use in mid-mount applications. 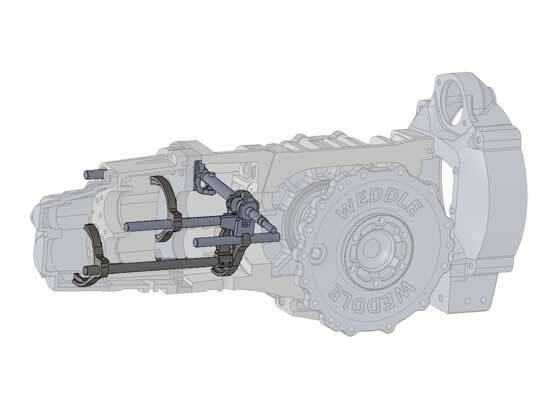 A specially designed shifter and bolt-on linkage are available. Internalized ball/cup. We relocated the ball/cup mechanism from the external adapter of the HV1 to inside the main case in the new HV2s. This allows the ball/cup to remain lubricated and grime free.